train & bus stations. If you let us know your ETA, we will come and meet you on arrival. Contact us for details. There is a direct bus service only during the Winter season from New Chitose Airport and Sapporo Train Station to Grand Hirafu Ski Resort. You need to make a reservation for the winter season direct bus service. * The nearby bus stop is "Grand Hirafu Welcome Center" for the winter season bus service from Sapporo or New Chitose Airport. * The nearby bus stop is "Kutchan Jyujigai" for the bus service from Otaru to Kutchan/Niseko. * It may go through Rusutsu Resort if you take the bus service from New Chitose Airport to Niseko Area. For detail information, please check with a web site of each bus service company. For more detail information, please contact a bus company. 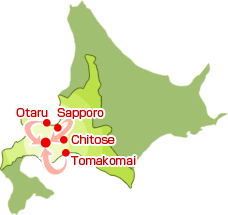 You can use a rental car from Hokkaido Central Area （New Chitose Airport, Sapporo and Otaru). * Visit above rental car company sites for your inquiry and reservation. * A special discount plan for Izumikyo guest only is available from "Nippon rental Car" and "Toyota Rental Lease".